Is your business using Facebook Messenger to the best of its ability? When we think about Facebook Messenger, it may just seem like a way to keep in touch with family and friends. However, with over 1.3 billion users, Facebook messenger offers many features and opportunities to help businesses reach and engage with their target audience. 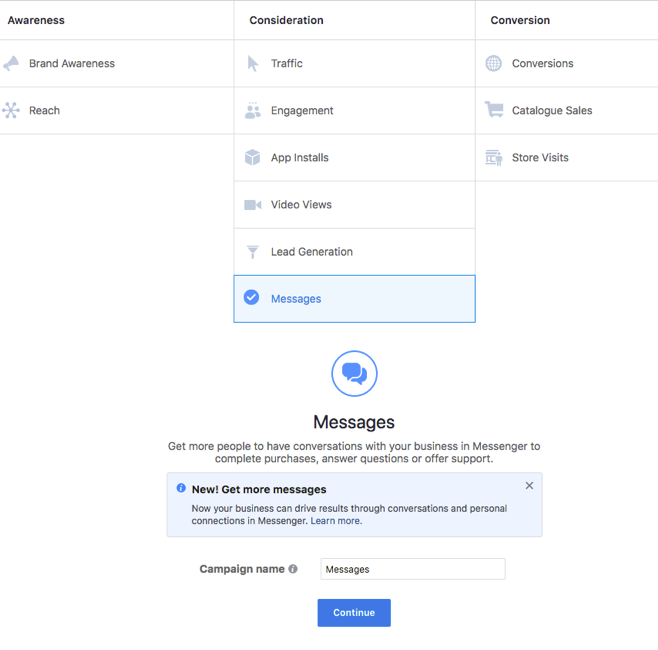 Recent updates have made it easier than ever for businesses to communicate with their audience, build brand awareness, drive sales and re-engage with previous customers – all via Messenger. Sounds pretty great, doesn’t it!? So, let’s explore some of the benefits of messenger for businesses. Messenger bots use artificial intelligence to converse with users. This basically means that the more a person converses with it, the better and more useful the responses will become as it learns what they are interested in and what they want to know – that’s right, this really is the future. Bots can understand what is being asked and respond instantly. Bots are especially useful when it comes to customer service and sales as they deliver real-time responses in a personal way. Using Messenger bots, you can set a voice that matches your brand voice, so users feel like they are interacting with you directly. Many businesses are beginning to use chatbots, and you can see why. Understanding how to create a bot for your businesses can allow your customers to easily ask questions, perform tasks and receive instant customer service in a way that still feels very personal. You can follow this Facebook quick start tutorial to get started on building your first bot. With over two billion messages sent between people and businesses each month, Messenger can help you to build brand awareness and find new customers. One easy way to build brand awareness is by running ads on the home screen of the messenger app. This function works in the same way as a normal Facebook ad but includes Messenger in the ad placement. To set this up, simply check the Messenger “home” option when choosing ad placement in the Facebook Ads Manager. Choosing this option can help increase your ads reach as people will see your ad on the home screen of their Messenger app. When they click on the ad, they will still be sent to your chosen destination – whether that is your website or a Messenger pop-up. Pretty easy right? Another great way Messenger can help to build brand awareness is through in-conversation sharing. Users can easily forward a message or image sent from your bot straight to their friends, ultimately furthering the reach of your message. 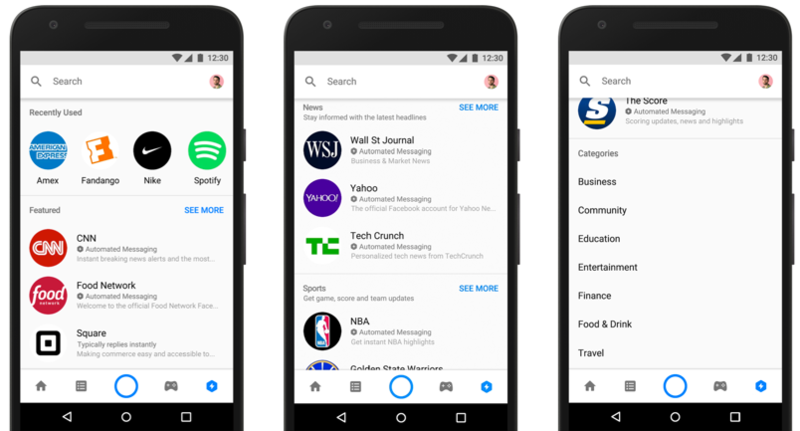 Using the discover tab, people can also browse and find Messenger bots, nearby places, and businesses to message. You can customise the categories where your bot appears and how it is described to further improve your visibility. To submit your Messenger bot, you have to have your page admin complete the discover submission form. For more info on this, you can check out the Facebook guide. Send to messenger plugin: allows a person to opt-in to receive messages from you on Messenger. Checkbox plug-in: implement in forms on your website to allow people to opt-in to receive messages from you on Messenger. Message us plug-in: a button that opens a conversation with your Messenger bot. 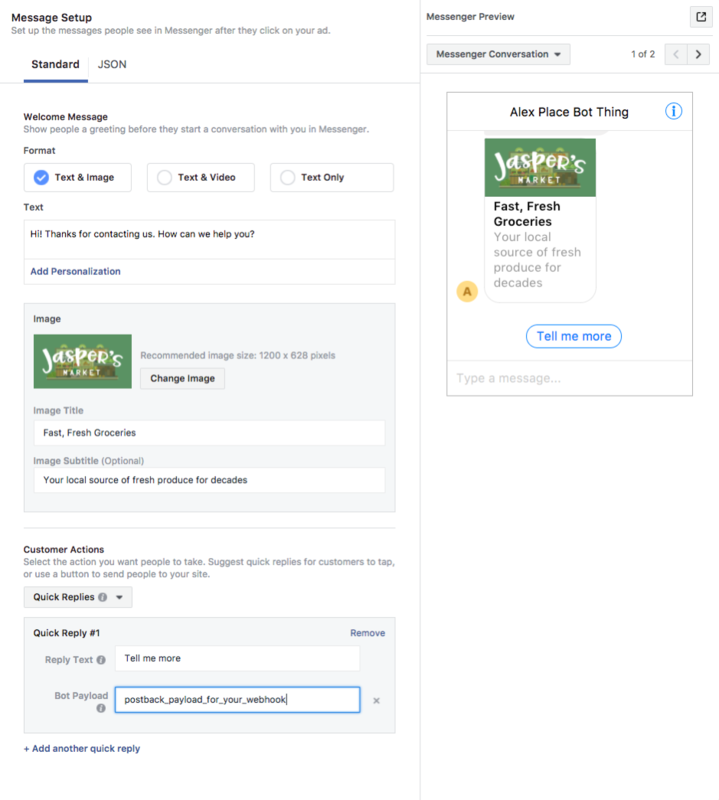 When setting up your ad in the Facebook Ads Manager, you can set the destination to Messenger with “click-to-messenger ads”. This can be a great way to gain exposure and increase engagement. What this means is that when a person interacts with your ad on Facebook, it will open in the Messenger app. Setting this preference can be useful if customers have common questions to ask or may need clarifications. You can set what content will greet people in Messenger such as quick replies and buttons like “how much does this cost” or “hours”. You can then test with different buttons and replies to find what works best for your business and that specific ad. This provides an easy way to generate leads, drive transactions and offer customer support. According to Facebook, 53% of people are more likely to shop with a business if they can message them directly. 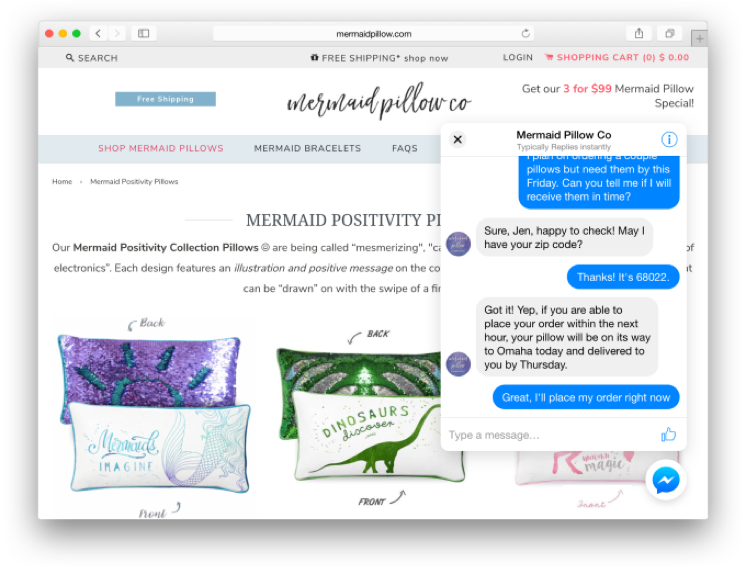 Companies can use Messenger to re-engage their customers and ultimately drive sales. You can interact with customers using live messaging, automated messaging or even a hybrid of both. Using sponsored messages, your business can re-engage with customers you have previously messaged. Sponsored messages are sent to an existing conversation between your business and a customer. This can provide your business with a great opportunity to re-engage previous customers or to send promotions directly to people you know are interested. You can set this up via the ads manager, choosing “messages” as your objective, choosing sponsored messages and the appropriate Facebook page. For more information on setting this up, you can see this Facebook help page. Given that 56% of people of people would rather message than call customer service, using Messenger can help brands easily engage with their customers and answer questions. According to Altitude, over 84% of customers expect a company to respond within 24 hours after posting on social media. This means the quicker a business can respond the better. If your business is not quickly answering questions and engaging with potential customers, you could be losing sale opportunities. Here are some features you can implement on Messenger to help assist your customers. Set a customisable greeting as the first message to appear when someone begins a conversation with your page. Using instant replies, you can set up an automated response to new messages. For example, you can use an instant reply saying that you’ll get back to them soon or thank them for getting in contact. If you are away, you can turn on away messages to let customers know. You can also set your page’s messaging status to away when it is outside of your business hours. These allow you to write and save messages, so you can easily re-use them. This is especially useful for commonly asked questions that people may have about your business. While still in the beta phase, Facebook is trialing pay options in the U.S. which allow business to add a “buy” button in the Messenger app. When the users select the “pay” button, Messenger will automatically complete the transaction using their connected PayPal account or card. 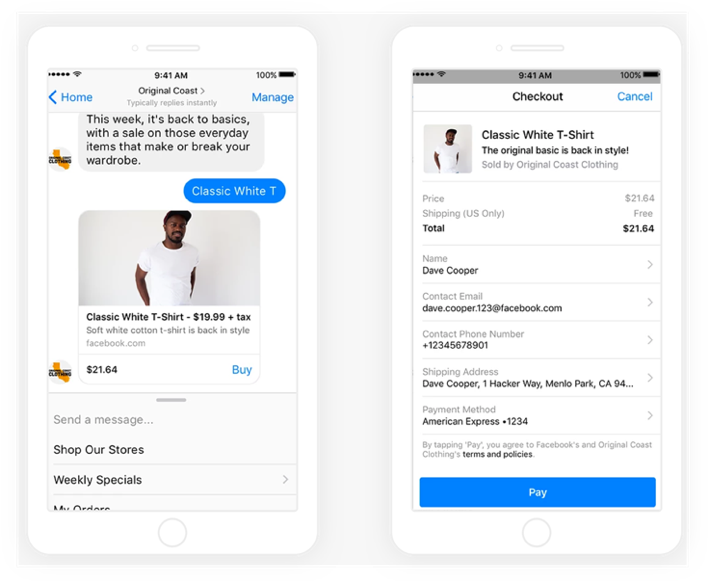 Buying products on Facebook will soon be easier than ever, as users can quickly and easily purchase straight from Messenger. With billions of users, Facebook Messenger has a lot to offer businesses. Understanding how to use these features can give your business a competitive edge, helping your business to reach a broader audience, generate more leads and drive conversions. 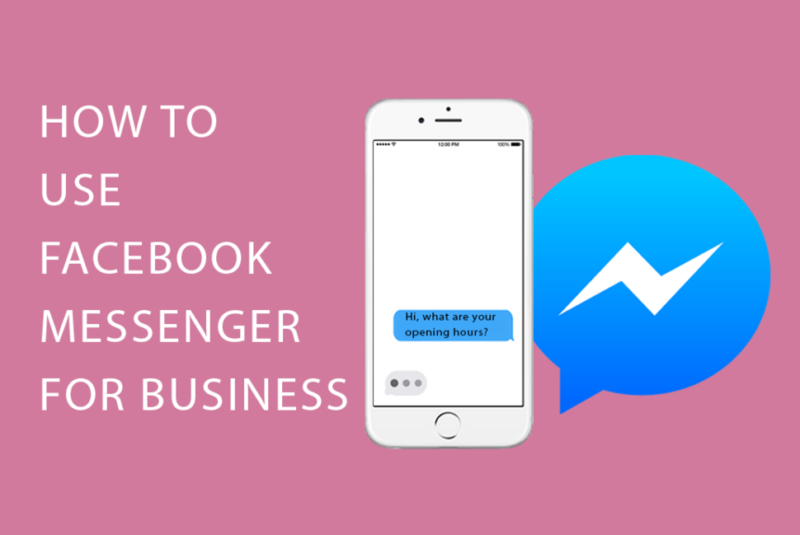 For more information on how to use Facebook Messenger for business, be sure to get in contact!